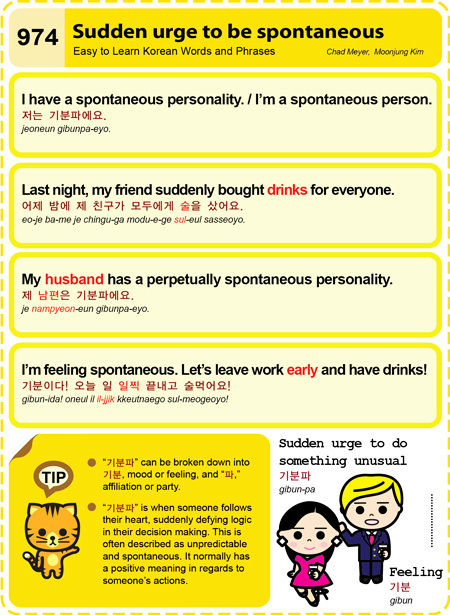 This entry was posted in Series and tagged drinks, feeling, friend, husband, last night, leave work early, person, personality, sudden urge to be spontaneous, sudden urge to do something unusual, 기분이다! 오늘 일 일찍 끝내고 술먹어요!, 기분파, 어제 밤에 제 친구가 모두에게 술을 샀어요., 저는 기분파에요., 제 남편은 기분파에요. by easykorean. Bookmark the permalink.